My thighs are now one of my favorite things about myself. Ever since I was young, I have always been fascinated by tattoos. Maybe it was the "emo phase" I went through in middle school and junior high, but I admired the people who had them and the variations of designs. For me, tattoos were a form of expression and I just had to have one. Over the years, I'd had numerous tattoo ideas, but in reality, they never happened. I got my first tattoo on my 18th birthday last year, and yeah, it was kind of spontaneous. I only really came up a concept for it a week before when I scheduled the appointment. I got a compass on my right shoulder blade since I was "taking direction of my life." It is also true that when you get your first tattoo, you do become addicted. There is just something about the buzzing of the tattoo machine that makes my heart flutter. Almost 11 months later, I've gotten my second tattoo. But this one has a more meaningful story behind it. Since junior high, I've always had low self esteem issues. I've never liked the way my thighs looked since I have stretch marks and cellulite. I try to remain confident because "that's how God made me and I need to appreciate it." I have also been the "curvy girl" and I've learned to embrace it, for the most part. However, I've always been in a love hate relationship with my thighs. I went into 2018 being the year of self-love, and it felt like it was about time to start this goal. For the past couple of weeks, I've thought a bit here and there what tattoo I want next and where to get it. And before you come at me, yes I have thought about possible future careers. I do not believe tattoos determine the worth of an individual, but I know there are people that think those with tattoos are some sort of badass punk. I like to think I'm a little badass, but I am probably the softest person you know. I finally decided on my tattoo early this month. A rose. I was going to go to one artist, but then I found Spirited Tattoo Coalition in West Philadelphia. The shop is a set up as a place for everyone to express themselves with no judgment. Since I was getting my tattoo in a very personal place, I wanted somewhere where I felt comfortable. When I got there, the tattoo artist, Eric, already had a design drawn up. It was love at first sight and I knew I was destined to get it. I didn't feel that much pain except for the shading areas of course, but I knew it was all worth it in the end. About 40 minutes later, I finally had the masterpiece. Now, the main reason for this tattoo is because I wanted to appreciate my body more. 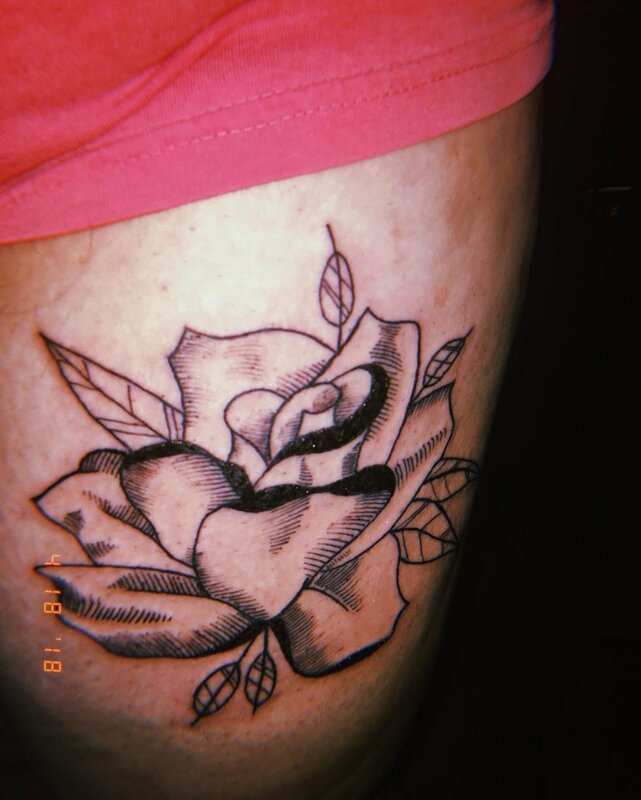 I figured if I got art tattooed onto my skin and if I can see the beauty of the ink, I can see the beauty of my thighs. I'm not saying for everyone that has self esteem issues to go get a tattoo. It is simply my coping mechanism, and it definitely helps. Since getting my tattoo, all I've wanted to do is show off my thighs. I'm not afraid of having my body photographed since everyone can now see my tattoo. I'm slowly starting to love my body all thanks to my tattoo.